The green oropendola (Psarocolius viridis) belongs to the family of New World orioles and oropendolas, the Icteridae. The green oropendola is distributed in Peru, Bolivia, Ecuador, Colombia, Venezuela, Guyana, Suriname, French Guiana and Brazil. This oropendola species has a very pale pink bill with an orange tip. This oropendola is a monotypic species. The green oropendola (Psarocolius viridis) is a large oropendola, measuring 50 cm in length and weighing 400 grams. The males are larger in size. The green oropendola has overall olive green plumage. The underparts are greenish yellow. The wings and the rump are darker. The central tail feathers are black and the outer feathers are yellow. The large, pointed bill has pale base and the distal end is orange. The irises are pale blue. There is pale flesh colored bare skin around the eye. The legs and feet are gray. Their call is a variable and complex song and "khah..khah" sound. The green oropendola species are distributed in Peru, Bolivia, Ecuador, Colombia, Venezuela, Guyana, Suriname, French Guiana and Brazil. Though these species are common in their range, they are patchily distributed. The green oropendola species have high forest dependence. They normally occur in altitudes from 0 to 1100 meters. The natural ecosystems and habitats of these oropendola species include tropical and subtropical moist lowland forests, tall humid forests and tropical rainforests. 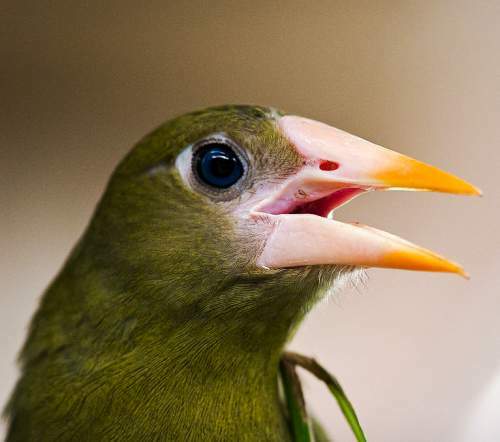 The diet of this green oropendola species consists mainly of invertebrates. Insects like grasshoppers, locusts, crickets, cicadas, aphids, planthoppers and leafhoppers are their primary food. They also feed on figs, fruits and berries. They forage by moving through the forest canopy in flocks. They also glean insects from the branches of trees and from foliage. The breeding season of these green oropendola species is from February to April in Venezuela and Suriname. The laying season is from July to December in Brazil. Polygamous behavior has been observed in these species. The nesting sites include horizontal branches of tall trees. They are colonial breeders and the nest is a long bag-shaped structure, dangling from the branch of a tree. These oropendola species are a non-migratory resident birds. The populations occurring in higher altitudes move to the lower levels in winter. The global population size of the green oropendola (Psarocolius viridis) has not been quantified. The overall population trend of the species is considered to be stable. In most of its range, this oropendola species is reported as common but patchily distributed (Stotz et al. 1996). The generation length is 4.6 years. Its distribution size is about 5,630,000 sq.km. Habitat alteration, fragmentation and destruction, deforestation and capture for pet-trade are the main threats that are endangering the survival of this oropendola species. 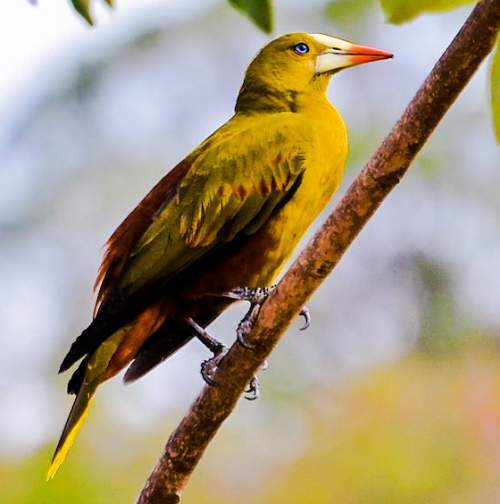 The green oropendola (Psarocolius viridis) does not approach the thresholds for being Vulnerable either under the range size criterion, or under the population trend criterion or under the population size criterion. The IUCN (International Union for Conservation of Nature) has categorized and evaluated the oropendola species and has listed it as of "Least Concern". 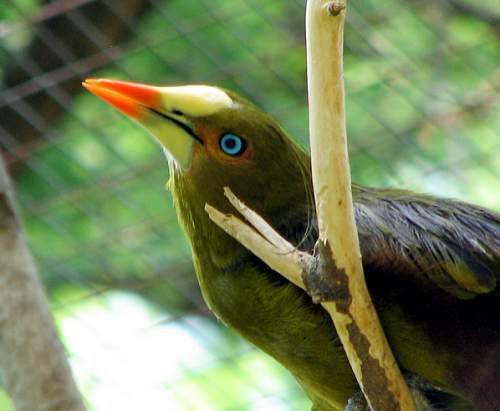 The CITES (Convention on International Trade in Endangered Species of Wild Fauna and Flora) status is ‘Not Evaluated’ for the green oropendola (Psarocolius viridis). The green oropendola (Psarocolius viridis) is closely related to the Amazonian oropendola (Psarocolius yuracares) and the crested Oropendola (Psarocolius decumanus). Current topic on Birds of South America: Green oropendola - Psarocolius viridis.